Hair and scalp feeling drab and dull? So you can fall in love with your hair again. *Free travel-size samples with every purchase. It‘s not extra. It’s essential. 100% Natural Ingredients: No Silicones, Parabens or Sulfates. 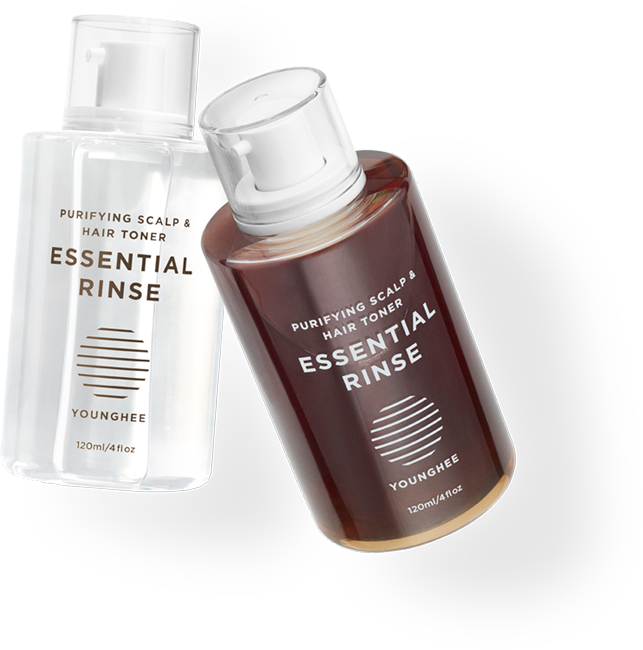 Essential Rinse Purifying Scalp & Hair Toner is a quick, effective rinse that leaves your hair and scalp residue-free—shinier and fresh-feeling. It’s 100% natural, and gentle enough for frequent use on color-treated hair. Essential Rinse comes in two fresh formulations. Try them both and let your hair and scalp decide your favorite! “I noticed a lift to my roots and a new shine to my hair. 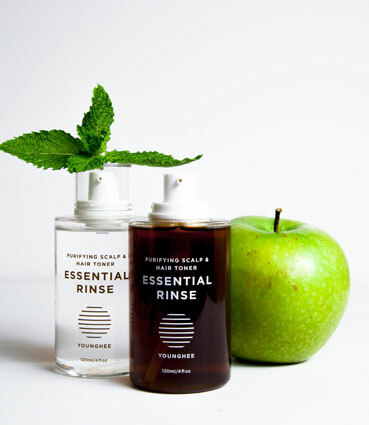 Essential Rinse works like a facial toner for your hair. No product residue is left behind to dull your hair or irritate your scalp. Gives shine and freshness back to color-treated hair. The ACV rinse is great to use right after coloring, flattening hair cuticles to seal in the color. The mint rinse is pH neutral, making it gentle enough for frequent use. By keeping your hair and scalp residue-free, you can use smaller amounts of your favorite shampoo and conditioner. Essential Rinse is made with the highest quality ingredients. There are NO silicones, parabens or sulfates. It’s simple: Essential Rinse was created for everyone. Can be used in between shampoo days or anytime your hair needs freshening. I am in LOVE with your new hair toners. The apple cider vinegar works wonders on my normally ﬂaky scalp, no more dandruﬀ! The mint toner is also fantastic; I use it twice a week without conditioner. It leaves my hair really shiny and soft. Thank you for creating these amazing products, I’m hooked!!! 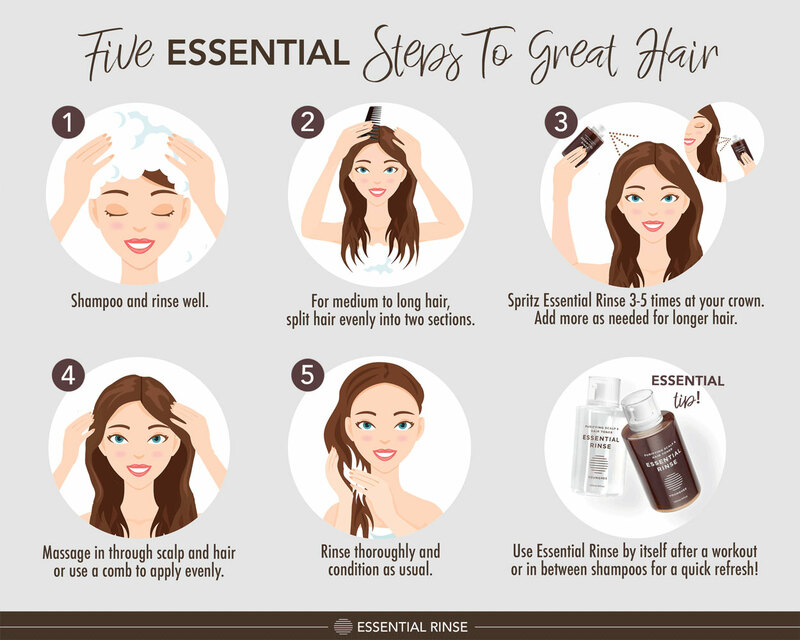 I have been using Younghee’s Essential Rinse for the last few weeks and I love it. I have long hair and I like to maintain my simple routine. Since using the rinse, my hair stays fresher longer and I like the shine it gives. Great for the in-between shampoo days! After using Essential Rinse, I noticed immediately my hair was a lot softer and shinier. Usually a full day after a normal wash, I would feel the need to wash it again because my hair would be greasy. A full day after using Essential Rinse, I still don’t need to wash my hair because it is still clean and soft. I feel this product helped my hair look healthier and better in general. I love it. Thank you so much. Background on my hair: ﬁne, straight, colored, rinsed daily but did not shampoo everyday. 1st use: my hair was and felt clean. A clean that I never felt before. 2nd use: my hair had lift. 3rd and continued use: my hair has volume and texture, and takes and keeps hair styling. I like both rinses and favor the mint scent. Your rinse is beyond awesome! I love Younghee’s Essential Rinse! It removes all of the undesirable residue build-up from shampoos that leave my hair feeling heavy, ﬂat, greasy, and easily tangled. After using the Essential Rinse, my hair feels so much lighter, healthier, and refreshed – and the mint ﬂavor leaves a wonderful tingly sensation. I’ve never seen another product like it. It’s a necessary addition to my weekly hair washing routine! After a long day in and out of subways and through the haze of construction, car traﬃc, oﬃce air conditioning, I always feel like shampooing was not enough– after I tried Essential Rinse, I felt a squeakiness to my hair and the next day everyone noticed a lift to the roots and shine to my hair. It felt like my hair follicles were breathing again 🙂 While traveling through Asia with the diﬀerent water quality and diﬀerent products, it was lovely to use the rinse to adapt to the new environments and maintain a healthy head of hair. I love using both rinses. A refreshing aroma arose when I massaged it onto my scalp. They both have a cooling sensation and I felt invigorated– I recommend this rinse to anyone and anytime especially after workouts or just a long grueling day at work. My hair felt so soft, like a baby’s hair…Still looks good after 3 days. After swimming, Essential Rinse is a great option to use instead of shampoo. It keeps my hair and scalp healthy. When I woke up in the morning, I noticed there was far less residue in my hair than before. And after following the same procedure a second time, my hair was basically rid of all residue…I’ve been using the toner for about a week now and my hair is the shiniest, softest and healthiest it’s ever been. My scalp is no longer an oil-producing machine and my ends aren’t as fried-looking as they once were. And the best part is I don’t have to change my haircare routine. The toner works with whichever shampoo and conditioner you love using. I’ve definitely found my dream haircare product in Essential Rinse. Internationally-renowned hair artist Younghee Kim always envisioned herself as a master hair stylist even as a child. At age five, she heated her father’s screwdriver on the stove and curled her sister’s hair. As an adult, Kim studied under Vidal Sassoon and eventually served as its Creative Director for eight years. She has also styled hair for television commercials, editorial shoots, and fashion shows. In 2000, Younghee Kim opened her namesake Younghee Salon in the Flatiron District, and later relocated to 64 North Moore Street in Tribeca in 2003 where her salon still resides today. To learn more about the salon, visit www.youngheesalon.com. For Younghee Kim, a hairstyle isn’t just about the cut—it needs to work seamlessly with each of her client’s personal lifestyle. “I like to design individual looks; the hair should move and fit like a perfect outfit,” says Kim. Her clients already know that every appointment begins with a full analysis (with many questions) on how their hair incorporates into their everyday lifestyle. “It’s about the details. Delivering individuality is the key to my work,” says Kim. It’s this realization that inspired Kim to create Essential Rinse, a purifying scalp and hair cleansing toner that removes residue that make hair greasy and heavy. “I understand that different types of hair involve different needs, so I needed a product that would be effective on all of my clients regardless of hair type.” Essential Rinse works with whatever your favorite shampoo is—simply massage a few pumps of Essential Rinse into the scalp and hair after shampooing or in between hair washes to remove residue for cleaner, shinier, and softer hair.